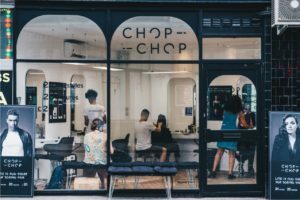 Check out our page (https://www.chopchoplondon.com/press/). We believe freelancing and collaborating with the talent (you) is the future of this industry. That’s why we pay well; our shops are in prime locations with high footfall: we attract high value customers; we have an app and booking platform to encourage customer loyalty and convenience. We are a very inclusive business and believe all are created equal. So, all our prices are gender neutral and it doesn’t matter what our customers’ ethnicities are – we cater to diversity. We are looking for self driven and ambitious barbers to join us in making a difference, whilst also making a name for yourself. We are growing fast with three salons already opened in prime locations (Old Street/Westfield Whitecity/ Kings cross St Pancras station) and a 4th salon early 2019. There’s a lot of opportunity to join us and grow to leadership positions. If you are a go-getter – get in-touch with your CV and contact details. We are looking for barbers able to perform skin fades and traditional scissors cuts, on all types of hair.